Each morning I walk to work. Each morning I see the same people. Each morning I play a game to myself and try to get someone to smile, by smiling at them first. No one does. Sometimes people look at me like I’m a bit nuts and do a crooked grimace. But never any eye crinkling window to the soul smiles for me from the residents of Islington. But, there is a small family run dry cleaners about 20 mins into my walk that is an oasis of happiness in the smile-less wilderness. 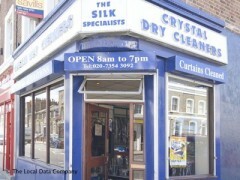 Crystal Dry Cleaners. Every day the man who works there waves and smiles as I march past. He makes my day. Last week I took my dry cleaning there. It’s not very convenient but I would rather take my dry cleaning to him than anywhere else. Because he smiles and waves at me. I’m greeted with a big smile and a cheery ‘hello sunshine – how are you?’ when I open the door. We chat easily about nothing in particular. I exchange my dirty clothes for a ticket with my name on. As I leave he calls after me “keep smiling – don’t let them grind you down Luce”. Normally I object to people I don’t really know shortening my name but on this occasion it feels good. When I pick up my clothes a week later he remembers my name, and what I bought in. We smile and chat again. While I’m in the shop, almost everyone that goes past waves, smiles or shouts some sort of greeting. Mark Sanborn may argue that he is a Fred. I think he just has a zest for life and loves people. For me the experience I get from something as simple as a friendly disposition and a genuine smile inspires me and gains my loyalty. I go out of my way to be their customer. Can your customers and donors say the same about you and your organisation? This entry was posted in customer service, Inspiration, relationships and tagged customer service, donors, dry cleaning, Fred Factor, mark sanborn, smile, walking. Bookmark the permalink. this is cute. I would smile at you!